Savvy buyers are discovering the incredible value of condominiums in Westchester County as compared to the Manhattan market. At The Residences at The Ritz-Carlton Westchester, a world of luxury can be found in exquisitely designed penthouse residences, accented by breathtaking views and fantastic amenities. Buyers also enjoy the tremendous value these residences offer compared to what their dollars will buy at a luxury condominium in Manhattan. For example, a 3,225-square-foot penthouse on the 40th floor of The Residences at The Ritz-Carlton Westchester sells for $2.9 million or $899 per square foot. In Manhattan, a comparably priced residence at the The Residences at The Ritz-Carlton New York, Battery Park offers 1,552 square feet of living space for $2,995,000 or $1,930 per square foot. 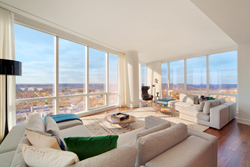 A 5,300-square-foot, 3-bedroom penthouse at The Residences at the Ritz-Carlton Westchester sells for about $5 million or $943 per square foot. In Manhattan, a comparably priced condominium at The Residences at The Ritz-Carlton New York, Battery Park has 2 bedrooms and 2,192 square feet of living space or $2,280 per square foot. “The bottom line is that the high-end suburban properties such as The Residences at The Ritz-Carlton Westchester offer more home for your money with the same level of quality service and amenities you will find in the finest Manhattan condominiums. It gives savvy purchasers a viable alternative to the pricey Manhattan housing market and is just an easy 30 minutes to Midtown,” said Nancy Kennedy of Houlihan Lawrence who is managing sales for the condominium tower. “And our views of the Manhattan skyline, Long Island Sound and famous Westchester countryside are truly amazing,” she added. Located in the heart of downtown White Plains, The Residences at The Ritz-Carlton Westchester features large, airy rooms with full-height, wall-to-wall windows; 9-foot to 11-foot ceilings; walnut hardwood floors with satin finish; stainless steel Viking appliances; marble baths, and spacious closets. Legendary Rit-Carlton amenities include 24-hour concierge; a glass-enclosed pool for year-round swimming; two outdoor terraces; a well-equipped fitness center; a large resident lounge/event space; and a private media screening room. There is also jitney service to the nearby White Plains Metro-North station. Exceptional dining and full catering services are available through The Ritz-Carlton, Westchester Hotel as well as on-site restaurants -- BLT, Serafina and coming soon Mediterraneo. In-room dining, housekeeping services and a full service spa are also available. There are 30 available residences and 12 floor plan options. The residences range in size from 1,489 to 5,400 square feet and are priced from $960,000 to $4,500,000.